Literacy blogger and distinguished professor emeritus at the University of Illinois at Chicago, Timothy Shanahan, is back with another post that is sure to make more holistic literacy specialists grind their teeth in frustration. 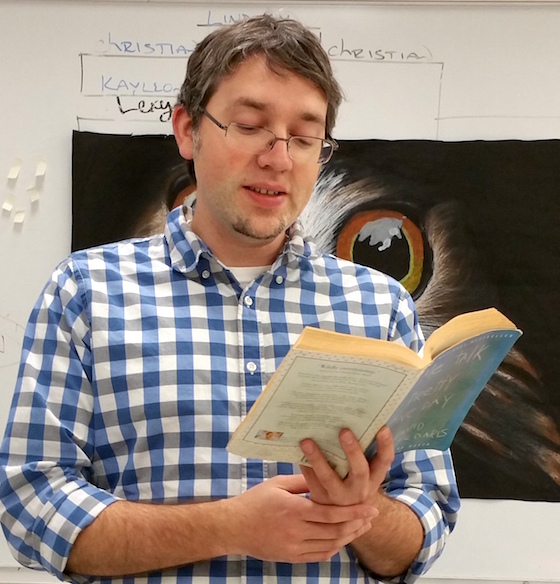 Many will read his post as a condemnation of reading aloud with older students. And it sort of is, with qualifications. Shanahan says that the best way to improve student reading is to have the students spend time reading and so any teacher read aloud must be brief, targeted, and occasional. But far from being an indictment of read aloud, his post suggests several places where reading aloud to older students is appropriate. I would agree absolutely that kids mainly get better at reading by reading – independently and widely. But, as I am sure Shanahan would agree, that time students spend reading must be engaged reading and it must be reasonably successful reading. Students do not get better at reading by merely looking at a page of print, they must be engaged with that page of print, trying to make sense of it. Students do not get better at reading by reading texts that are too difficult for them unless they have some sort of mediation from other texts or from the teacher. It is at this juncture between engaged, successful encounters with text and disengaged, unsuccessful encounters with text that we can find our greatest rationale for using read aloud with older children. As read aloud guru, Jim Trelease, has said, “If you stop reading aloud [when kids are older], you stop advertising.” Many students, and especially many secondary students, are not terribly motivated to read. Anyone who has spent time in the middle school classroom knows that a large part of the job is leading the child to the water and convincing him it will be refreshing to dive in. Read aloud is a great ally here, because the great authors and their wonderful ways with compelling stories and vivid words draw students into a world they want to be a part of. Teachers can use read aloud to “advertise” for a particular author, or expose children to a different genre. Another thing we “advertise” when we read aloud is our own personal passion for reading and the joy we take in sharing something that we have read with others. And so we read aloud to older students to show them what is out there that they might enjoy, to encourage them to sample other genres that they may not have tried as yet, and to model the joy and knowledge we get from being a reader. For the students in our survey, it is clear that high- engagement reading and language arts classrooms would include time to read, time to listen to teachers read, and access to personally interesting materials [emphasis mine]. In addition, Vacca, Vacca, and Mraz (2017) say that read aloud “can provide important background knowledge that enhances student understanding of assigned readings (p 322).” Difficult concepts in science and social studies can be made clearer through read alouds of picture books and other easy to digest texts that fill in gaps in students’ conceptual understanding of a topic. I think every content teacher in the middle school and high school should have a large supply of picture books and popular texts to read aloud to help students navigate the often-challenging textbooks they are expected to read for class. In this way read aloud is helping students be more successful in their reading and, therefore, making it more likely they will read assigned material. Employed this way, read aloud sets students up for more successful and deeper comprehension of assigned reading material. The benefits of read aloud with older students are clear. The question now becomes, “How much read aloud?” To answer this question all teachers have to assess their own instructional situation. Many middle and high school teachers have as little as 40 minutes of class time a day. Can we justify read aloud in these brief time periods with all we have to address in the curriculum? Shanahan says that read aloud should be brief, targeted, and occasional. I see his point, given limited time resources and the known value of kids spending as much time as possible reading material on their own. Nonetheless, I would come down on the side of read aloud that is sometimes brief, but sometimes extended; sometimes targeted, but sometimes just for fun; and occurring frequently. Shanahan has made the argument for the benefits of brief and targeted read aloud. The argument for extended read aloud flows from my understanding of the role of read aloud in fomenting student engagement. Sometimes we must take the students beyond the brief passage and into the rich world that only can be found through the shared experience of a complex, well-written, full-length novel, read over time, discussed in a way that comprehension is socially constructed and enjoyed as a whole class experience. Sometimes, also, our goals cannot be targeted on a particular reading strategy or on filling in some missing background knowledge, but rather aimed at exposing students to texts and genres they might not pick up themselves, so that students can begin to see the breadth of what is available to them in the reader’s world. A few years ago, Joseph Sanacore wrote an article praising read aloud as a strategy with older readers (1992). In the article, he offers some tips for read aloud. I would like to share a few of his tips here. · Select material you love and you think your students will love. · Practice reading the selection several times. · Encourage active listening through having the students look at the title and any illustrations and have them make predictions. · Read with expression and vary your intonation as appropriate for the text. · Ask open-ended questions after the reading to help students talk about what they have heard. · Choose from a wide variety of text types. To this list, I would add talking about new and interesting words you encounter in the text. Many researchers have found that reading aloud combined with direct explanations of words and discussion is a powerful way to expand student vocabulary (Duke, N. et. Al, 2011). So yes, please continue to read aloud to older children because it is an educational best practice. Ultimately, we seek to develop students with both the skill and the will to read. Read aloud can help. We just need to be sure we are using this powerful tool in the service of accomplishing this goal and also be sure that all students get plenty of opportunity and time to read independently. For further reading, I would recommend Steven Layne's excellent new book, In Defense of Read Aloud: Sustaining Best Practice, from Stenhouse Publishers. Duke, N.K., et.al. (2011) Essential Elements of Fostering and Teaching Reading Comprehension. In Samuels, S.J. & Farstrup, A. What Research Says about Reading Instruction. Newark, DE: International Literacy Association. Ivey, G. and P. H. Johnston. (2013). Engagement With Young Adult Literature: Outcomes and Processes Reading Research Quarterly, Vol. 48, No. 3, pp. 255-275. Vacca, R., Vacca, J. & Mraz, M. (2017). Content Area Reading. New York: Pearson.